Commonwealth Scholarships United Kingdom, Since their inception in 1959, some 27,000 individuals have benefited from the award of Commonwealth Scholarships and Fellowships to pursue advanced academic study in other Commonwealth countries. About two thirds of awards have been tenable in the United Kingdom. The vast majority of award holders have returned to make a significant contrib -ution to their home countries, in many cases at the highest level, making the award scheme one of the largest and most prestigious in the world. This prospectus describes the Commonwealth Scholarships offered by the Commonwealth Scholarship Commission in the United Kingdom for citizens of other Commonwealth countries in 2013-2014. Separate programmes and prospectuses exist for the scholarships offered by distance learning and on a shared funding basis, and for short mid-career fellowships, both academic and professional, offered by the Common -wealth Scholarship Commission. Please visit the CSC website at www.dfid.gov.uk/cscuk for details of these programmes. 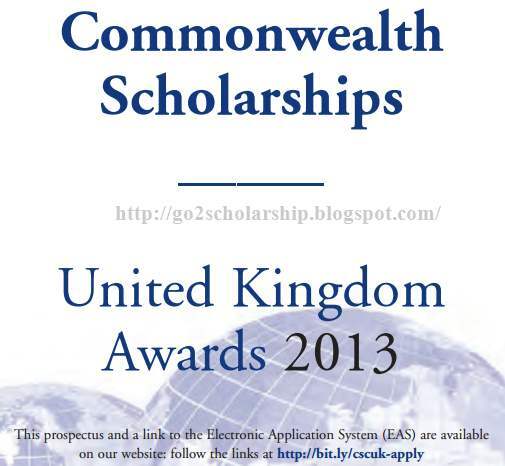 For information on Commonwealth Scholarships offered by other Commonwealth countries, please visit the Commonwealth Scholarship and Fellowship Plan (CSFP) website at www.csfp-online.org The secretariat of the Commonwealth Scholarship Commission in the United Kingdom is provided by the Association of Commonwealth Universities (ACU), which is responsible for all matters concerning selection and academic studies. The British Council is responsible for payments to scholars, and for arranging travel, reception and other support services for them. • For enhancing clinical skills in the fields of medicine and dentistry, have qualified as a doctor or dentist between 1 October 2003 and 30 September 2008. Please see http://bit.ly/cscuk-apply for fellowship opportunities if you qualified before October 2003. The Commission wishes to promote equal opportunity, gender equity and cultural exchange. Applications are welcomed from the many different races and origins that comprise the Commonwealth’s rich variety of cultures, traditions and institutions. WHAT T YPES OF AWARD ARE AVAIL ABLE AND HOW CAN I APPLY?